It is absolutely necessary to get hold of the right WordPress membership plugin to maintain a successful membership site. Right from efficient form creation to dynamic user profiles a good WordPress membership plugin should take care of it all. A WordPress membership site opens up a host of potentials to flourish your online business. However, being able to manage it efficiently is the key to sustain it and earn a steady revenue. In order to do so, you need to get hold of the best membership plugin WordPress. And that’s what ProfileGrid Plugin does. Mostly all the start-ups around the world, who are earning billions every year are using the membership strategy as their key source of revenue and growth. The credibility and success of your business increase when users get to create an account on your site and see their profiles among many other fellow users. The WordPress ProfileGrid plugin lets you do just the same thing. This plugin is considered one of the best WordPress membership plugin since it can create a complete membership site from scratch. From stunning profile pages to integrating e-commerce features this plugin provides all that you need to build a professional membership site. 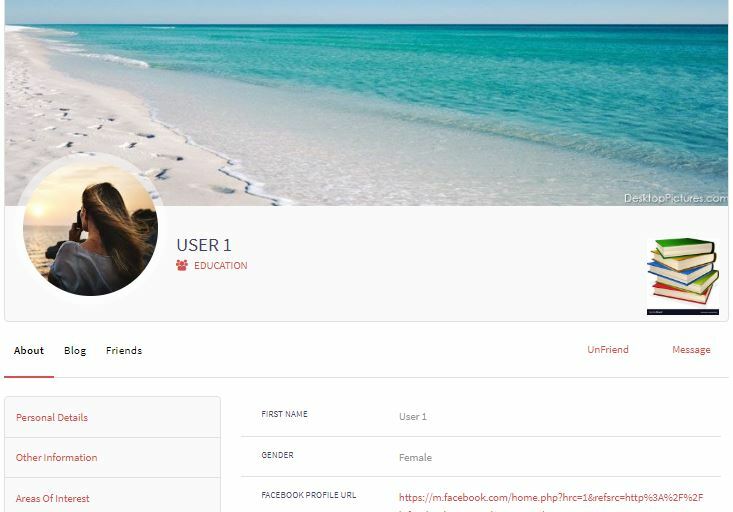 The user accounts created with ProfileGrid can interact with each other, post blogs and sell products from their frontend profiles. Along with its inherent features like Global Settings, Email Templates, User Profile management, ProfileGrid comes with two magic spells Shortcodes and Extensions. I will start today’s discussion about this WordPress membership plugin by first talking about the Shortcodes. Since they are the primary elements of the ProfileGrid plugin that does most of the jobs for its users. The shortcodes basically act as shortcuts here, for they spare you the trouble of coding. From user profile creation to frontend group creation or user map generation, the shortcodes are the key to get your job done in a few clicks. After installing the ProfileGrid plugin on your site, activate it. Then you will find the ProfileGrid menu item in your WordPress dashboard. In the plugin menu, you will find a Shortcode link. Here, you will find an entire page dedicated to WordPress shortcodes. One just needs to copy these shortcodes, paste them in a new WordPress page and publish them on the frontend. So, for example, in order to create a WordPress membership profile, you will need the [PM_Profile] shortcode. ProfileGrid offers shortcodes for easy custom form creation. 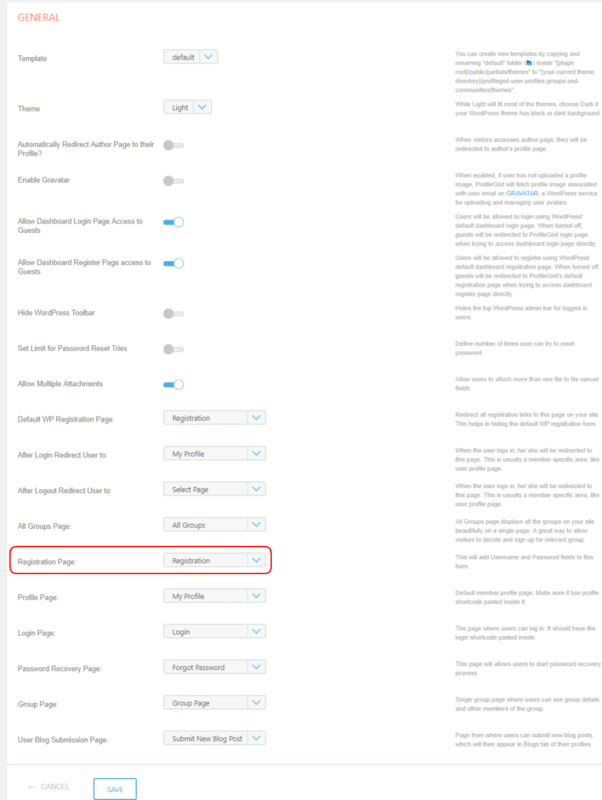 One can display multi page registration form in WordPress. Users can even convert them into single page forms by virtue of shortcodes. The last link on the ProfileGrid menu is that of the Extensions. Once you click on it you will land on a page entirely dedicated to Extensions. These extensions will give you a one-click solution to your site building with this WordPress membership plugin. Activate any of them and you are good to go. The admin can generate map locations of user or groups, set up Stripe payment system or allow registered users to create groups on the frontend. There are several other extensions to boost your site, for example, easy integration of WooCommerce, bbPress, and MailChimp. Along with shortcodes and extensions, ProfileGrid also comes with its own default pages. These are, for example, Profile page, Search page, Registration page, Group Wall page, etc. When you go to the Pages section on your WordPress dashboard, you find the default pages. They also come with their respective shortcodes pasted on them. So, in order to create a WordPress user profile page, we don’t even need to paste the [PM_Profile] shortcode in its default page. Just name the page whatever you want and publish it. Later, we will assign this page to make it appear on the frontend. Before registering users with this WordPress membership plugin, you need to create Groups, wherein you will list your users. To do so, click on the ProfileGrid link. The screen where you will land is called the Groups Manager screen. On this screen, you will see that there is a small section for creating a new group and a Default Group. The Default Group comes pre-installed with the plugin and you can use this group for testing purposes. But here, we will create a new group first. Click on the Add New link at the corner of the screen, a New Group page will appear. Name and configure your new group from here. Then the new group’s card will appear next to the Default Group. Now, in this group, you can take new WordPress membership. Next, in order to start WordPress membership on your site, you first need to create a registration form. This registration form should have all the data that you need to make sure he/she is an authentic user. When your users submit this form, they get to create their own user profiles. Tips: With ProfileGrid, creating a custom registration form is also a matter of cakewalk. You need not depend on default WordPress form neither do you have to install a form building plugin. All the information fields are already provided by ProfileGrid, you just need to add them on your form and publish it on the frontend. To create registration forms, you must create ‘User Groups’ first, to which you then add users. Since the New Group where new users will be registered is already created. Start adding information fields to your custom form. Click on the ‘Fields’ option on the bottom corner of your newly formed group. The page where you will land will have an option on the top left called New Field. By clicking on this option, you will see a list of fields opening up; from here you can add the desired fields on your user registration form. 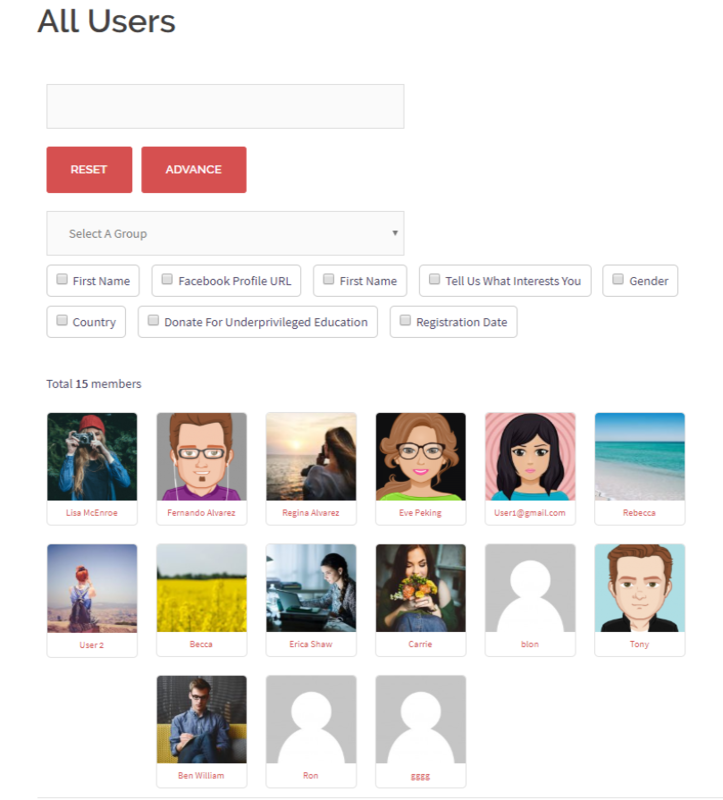 So, this free WordPress membership plugin not only lets you create user profiles but also makes sure you get to create individual registration forms for each group. Now go on to publish your registration page on the frontend. We will do it the same way, we published the Profile Page. I have already mentioned that ProfileGrid creates a few default pages and the PM Registration page is among them. So take the shortcode [PM_Registration id=”x”] from the shortcodes page and paste it on the PM Registration page. Now in place of x put the group id of your newly formed group to which you have added data fields. My new group id is ‘4’ so I will apply that within the shortcode and click on ‘Publish’. This will transfer all the fields that we added to the group to the registration page. The users, while registering will fill up these fields and after submission, their given data will appear on their profile pages. Next, we will proceed to assign this page. In order to display this page on the frontend, one has to assign it. To do this, first, go to ‘Global Setting’ from ProfileGrid’s list of options and then click on ‘General’. 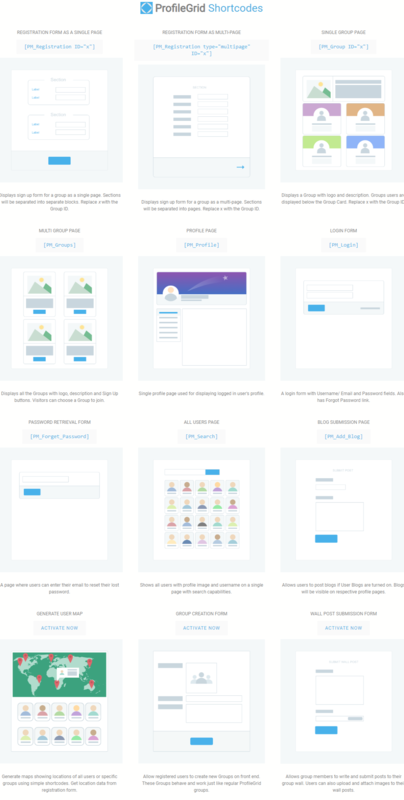 You will land on a page that will let you choose the appearance of the frontend profile, assign pages, etc. As you can see from the above image, I have selected the ‘Registration’ page where there is the option to assign this particular page. Likewise, on the same page, one can decide which page to come after registering users or where users should land after logging in. I have selected ‘Profile Page’ after the users log in. All these pages are created in the same manner we created the registration page. For example, paste the shortcode [PM_Login] on the default page created by ProfileGrid, publish them and then assign them. So now let’s show you how a ProfileGrid user profile page looks from the frontend. Now, I will spare a few words on Global Settings. It is one of the most essential features of this WordPress membership plugin. 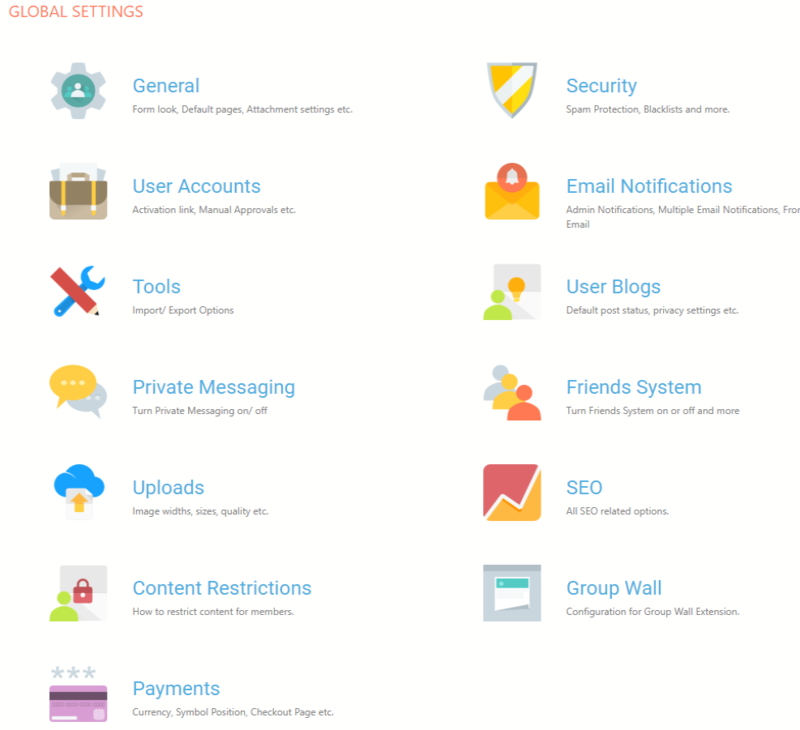 The Global Setting menu found on ProfileGrid’s menu list helps users to manage all the groups from one page. We have already talked about the General menu here. That helps users to assign pages, determine frontend appearances, etc. The Security menu allows users to take security measures like adding reCAPTCHA, blocking email and IP addresses. Added to that there is the option to list blacklisted words, set up auto-logout feature after user inactivity, etc. Then comes User Account. It helps the admin to take actions on user accounts. For example, enabling auto approval after registration, account deletion warning messages, user account appearances, etc. Next is, Email Notification. 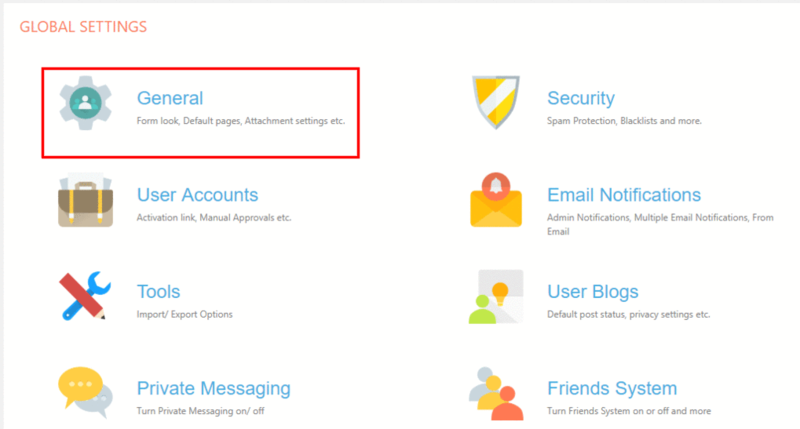 The admin can send automated email notifications to all users from here. There are customizable email templates for various purposes here. The Tools menu helps admin to export or import user metadata to/from other destination. The User Blogs menu allows the admin to enable and manage a blogging system for site users. Private Messaging once enabled from here, allows frontend users to send messages to each other privately from their profiles. Friend System once enabled by the admin lets the frontend users send friend requests to each other. Uploads menu lets the admin manage all the file uploads made by his/her users from the frontend. SEO helps the admin to set up SEO for the site. For example, they can choose to set up a user profile page title and description from here. Content Restriction helps the admin configure privacy settings to site content. Group Wall enabled from here displays Group Wall feature on the frontend. They can enable settings like image upload, TinyMCE Editor, etc from here. The admin can enable PayPal processor from here. This will allow them to build paid membership site using PayPal. This WordPress membership plugin gives you the advantage to integrate third party plugins to boost your user profiles. Moreover, it will allow users to subscribe MailChimp list. Added to that there are WooCommerce, bbPress and Stripe Payment system extensions for one-click integration. Apart from that users can easily integrate other plugins like Easy Media, Business Directory etc to boost user profiles. ProfileGrid also allows you to list your WordPress users and their metadata on the site frontend. This will let you manage and display your users conveniently. Tips: Just create a Search Page on your site frontend. The Search page is also one of the default pages of the plugin. Paste the [PM_Search] shortcode on a new WordPress page and publish it. All your users irrespective of their groups will appear on one single page. Now refer to our complete guide to create membership site with WordPress to earn revenue with your own user base. Needless to say, ProfileGrid’s dynamic user profiles have a versatile industry usage. 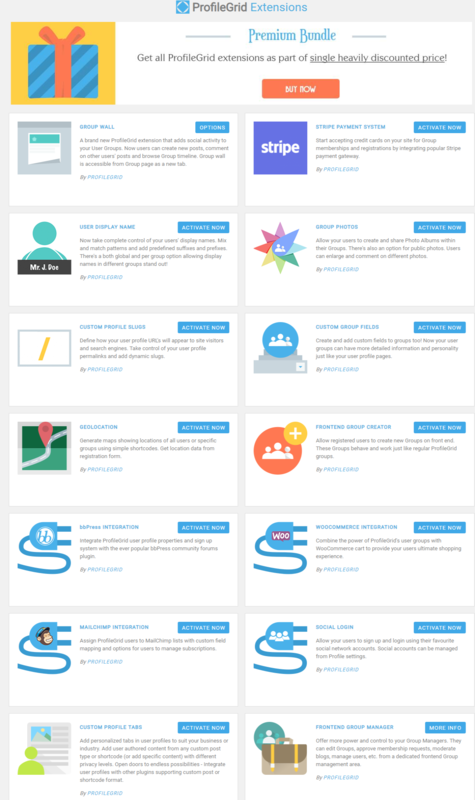 From schools, offices and other organizations, people can use this plugin to enlist their pupils and employees to create a business directory. Individual site owners can start their own online store with ProfileGrid and provide registered user profiles to their customers. Here the customers get to interact with each other and the owner can share live updates of offers and discounts directly to these users. There are even scopes of creating a pure membership site where the site owner gives the privilege of selling products, postings blogs etc to the registered profile owners. The ProfileGrid plugin is not just a versatile plugin that takes care of your entire membership site. It is also very lightweight and easy to use, even for amateurs. There is hardly any need to code or design after installing this plugin. Thus it is considered the best membership plugin WordPress has ever offered. So, wait no more, start your own WordPress membership site with ProfileGrid and open up newer horizons for your business. About ProfileGrid Editorial Team: Team of WordPress profiles & community experts and major contributor to the development of ProfileGrid Plugin. Is it possible to make a group free and premium both?